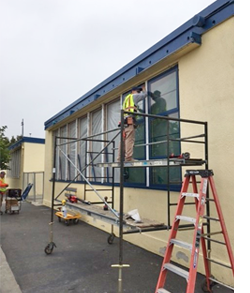 The District is currently replacing windows throughout the District to improve design, efficiency and ensure optimal classroom comfort. The district is improving field lighting efficiency and significantly cutting energy use at SAMOHI Sealy baseball field and football field as well as Lincoln Middle School fields. By installing Musco’s TLC for LED technology lighting with efficiencies gained by the 24/7 scheduling and monitoring support of Control-Link® system, energy consumption is reduced by 60% compared to typical metal halide equipment. This will reduce the District's CO2 emissions by 1,225 metric tons, which is the equivalent of taking 259 cars off the road for one year.